How will Facebook monetize mobile? Its organic-seeming Sponsored Stories ad format may be the answer. Mobile Sponsored Stories are getting over 13 times the click-through rates and earn 11.2 times the money per impression (eCPM) on mobile compared to all of Facebook’s desktop ads, and 1.93 times the CTR and 2.65 times the eCPM of Sponsored Stories on the web in the two weeks since Facebook began selling them separate from web ads. The data comes from new studies by TBG Digital, AdParlor, Nanigans, and Spruce Media, three of Facebook’s biggest Ads API partners that help brands buy ads. Since Sponsored Stories slip into content feeds so seamlessly, Facebook may actually be better equipped to handle the shift to mobile advertising than other web-first tech companies. Let’s check out the early proof. Much of the doubt surrounding Facebook’s IPO came from evidence that the social network’s user base was shifting away from the web to mobile, where Facebook only began testing ads in February. On the web users are shown up to seven ads per page and some spend big sums on social games, but on mobile they’re only shown a couple of ads per day and few pay for games on Facebook’s HTML5 gaming platform. Fears about Facebook’s mobile future are partly to blame for its share price sinking from its $38 opening to around $31.50 today. But earlier this month, Facebook began allowing advertisers to specify that they wanted their ads only shown on mobile, and now the world is getting its first deep look at how Facebook mobile ads perform. The results could make investors more optimistic. TBG Digital’s CEO Simon Mansell tells me “this is huge news that show mobile is potentially going to be the big revenue driver that Facebook needs, especially because the usage in there.” Here’s the results of two data sets shared exclusively with TechCrunch plus more confirmations from the ad industry. According to a new study by TBG Digital on 278,389,453 Sponsored Story ad impressions across 17 clients, mobile news feed Sponsored Stories (the only ads Facebook shows on mobile) have a stunning click-through rate of 1.14% at a $0.86 CPC. That means Facebook earns $9.86 per 1000 impressions (eCPM), and that could actually rise as more advertisers realize the power of mobile Sponsored Stories and compete for impressions there. Compare those numbers to the desktop news feed Sponsored Stories that get a 0.588% CTR at $0.63 CPC and earn Facebook an eCPM of $3.72, and Facebook is getting 1.93x the CTR and earning 2.65x as much on mobile sponsored stories compared to what it makes on the web. And look at Facebook’s desktop ads as a whole, including both Sponsored Stories and the traditional sidebars ads. They’re getting just 0.083% CTR at a $0.88 CPC earning Facebook an eCPM of only $0.74, so mobile Sponsored Stories have 13.7X the CTR and earn Facebook 11.2x as much as its combined desktop ad offering. Meanwhile, a quick look at a campaign in the tens of thousands of dollars by AdParlor showed that mobile ads have a CTR of 0.821% while traditional Facebook ad campaigns that mostly show up in the web sidebar with some presence in the web and mobile news feed had a CTR of regular ads have a CTR of just 0.032%. That’s a 25x better CTR on mobile. The campaign at gaining new fans for a Facebook page, and while the click-to-fan conversion rate on mobile was slightly worse — 55% on mobile versus 72% across placements – the improved in CTR makes up for it many times over. Other sources in the ad industry confirm the high performance of Facebook mobile ads. Another Ads API giant Spruce Media told MediaPost that its tests with Facebook mobile sponsored stories have seen click-through rates from .8% to 1.7%, the same range as TBG Digital and AdParlor. Update: Nanigans, a top Ads API choice amongst gaming companies, says it’s seeing an average of 0.79% CTR for mobile Sponsored Stories, but with smart additional interest targeting layered on, CTRs range as high as 2%. This all doesn’t seem like users are just clicking the relatively new, three month old ad units out of curiosity. It looks like users are actually perceiving them as content, and are clicking through to learn more about the Pages and apps their friends interact with. Attaining such a high click-through rate for mobile Sponsored Stories is game-changing for Facebook, because there’s simply not as much room for it or any service to advertise on mobile. There’s no space for an ads sidebar and if far too many ads are injected into the content feed, users could get angry and stop browsing. But the impressively high CTR and eCPM mean Facebook doesn’t have to show too many Sponsored Stories to make a ton of money off of them. Other social sites like Google+ and Twitter don’t have the scale, social graph, or on-site activity to serve Sponsored Stories that are as effective as Facebook’s. While Twitter and G+’s interest graph can power accurate ad targeting, only Facebook know who your closest friends are thanks to photo tags, wall posts, messages, and more. Its massive time-on-site also produces lots of interactions with brands and local businesses that can be turned into Sponsored Stories ads. And Facebook is just getting started. Sources say it’s working on a hyper-local mobile ad targeting product that could serve extremely relevant local business ads to users within a few hundred feet of a brick and mortar store. Thanks to the new Facebook Exchange real-time bidding system, Facebook could drive up CPC or CPM prices by getting advertisers to compete to reach specific mobile users, including ones who’ve been retargeted after visiting sites that indicate purchase intent. Legality is one of the last hurdles to the success of Sponsored Stories. Facebook settled a class-action lawsuit in California last week for using people’s likenesses in ads. It doesn’t currently offer an opt out for Sponsored Stories, but may eventually have to. Still, the setting would likely be buried deep enough to avoid too many people turning the offer the money-maker. In the last two weeks, Facebook’s stock price has climbed nearly 20%, regaining a big chunk of what it lost since the IPO. Those who bought in at the bottom are looking wiser now. High mobile Sponsored Story CTRs indicate at least some users don’t hate the ads, and wouldn’t rebel if they see more. 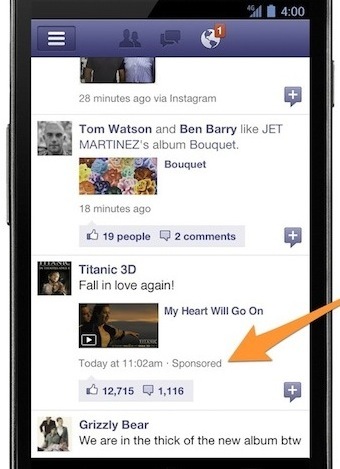 Now Facebook has to strike the right balance of how many mobile ads to show. If it succeeds, it could walk the tightrope of the shift to mobile, end up a very rich company on the other side, and generate the returns that so many have hoped for.